Route: From Ferries to 19th Avenue and Sloat Boulevard via Market, Haight, Stanyan, Frederick, Lincoln Way, 20th Avenue, Wawona and 19th Avenue. 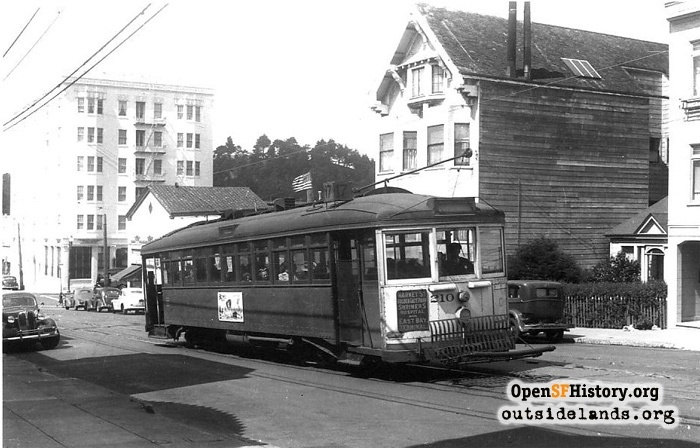 A Market Street Railway line, the 17 Haight and Ingleside used the tracks of the 7 Haight and Ocean line to get to Lincoln and 20th Avenue; from there the tracks of the defunct Parkside Transit Company's line took passengers south on 20th and 19th Avenues. On Sundays and holidays the 17 continued down Sloat Boulevard on the 12 Mission and Ingleside tracks to Fleishhacker Pool, the Zoo and Ocean Beach. "The 17-Haight & Ingleside was originally Ellis & Ingleside. After February 17, 1916, the route [extended to] 19th Avenue, Sloat, Junipero Serra, Ocean Avenue to Miramar Avenue hence the 'Ingleside.' 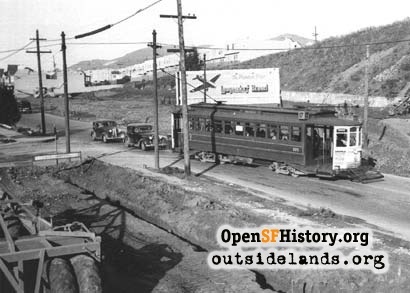 Sometime after the K-line began service to the Ingleside, the 17 was cut back to 19th Avenue and Sloat, except on Sundays when the line continued down Sloat to the Zoo. The Zoo extension was discontinued December 29, 1937 because of the widening of 19th Avenue and the terminal was now 19th & Wawona. Prior to the Taraval trackage (west of 20th Avenue) being sold to the Muni for the L-line, on Sundays the 17-cars used the Taraval trackage to go to the Zoo. Parkside Shuttles on Sundays instead running from 20th Avenue & Taraval to the Zoo ran to Ocean & Miramar. With the advent of the L-line, Parkside Shuttles were discontinued. 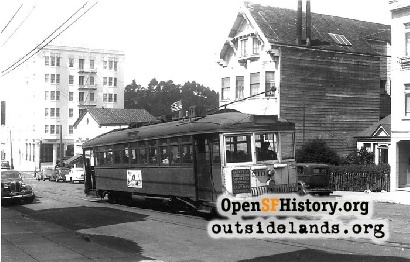 Sometimes the 17 was called "Haight & Parkside" thereafter, but usually as "Haight & Ingleside" even though it did not run to the Ingleside and after 1937 could not!" Sources: Walter Rice; Jack Tillmany; John Coll; The White Front Cars of San Francisco, Charles A. Smallwood, Interurbans Press, 1971. Page launched 12 September 2002.